Model T Ford Forum: 1909 Canadian Model T with Chadwick Bros. brass lights. 1909 Canadian Model T with Chadwick Bros. brass lights. Model T Ford Forum: Forum 2014: 1909 Canadian Model T with Chadwick Bros. brass lights. I was wondering if anyone with a Canadian built 1909 T ,had Chadwick lights on them ? Did the cars exported to Australia have Chadwick lights on them ? Our 09 has the Chadwick headlights & cowl lights,but is missing the tail light.It didn't have a tail light on it when my late friend Tom bought it in 1952. 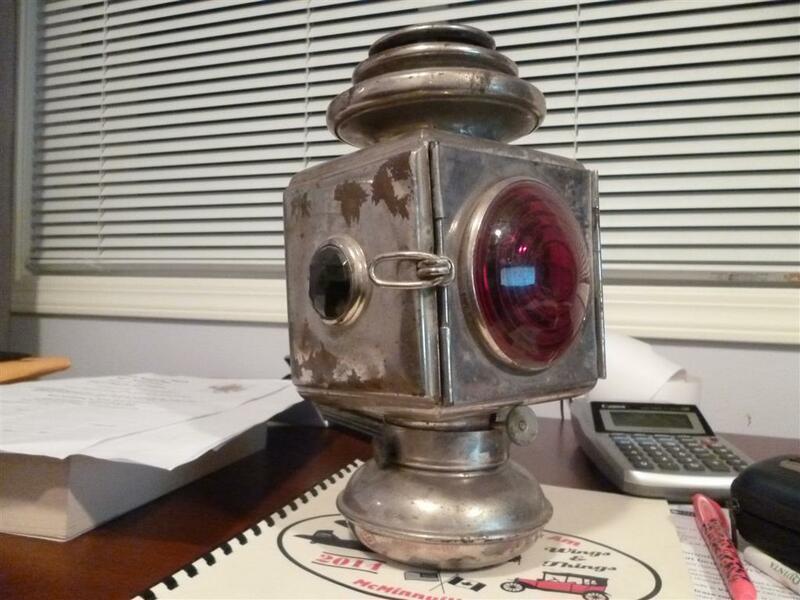 Does anyone have a picture of a 1909 Chadwick tail light for a T.Or better yet a tail light for sale. Never heard of this brand before. Sounds like after market & not factory fitted to me, but I am not a Canadian 1909-10 expert either. Hopefully one of those guys will chime in and help. Pictures would be great. I've never heard of that brand of lamp - would love to see an example. These were factory lights put on some 1909 Canadian Model T Fords made in Walkerville,Ontario,Canada. 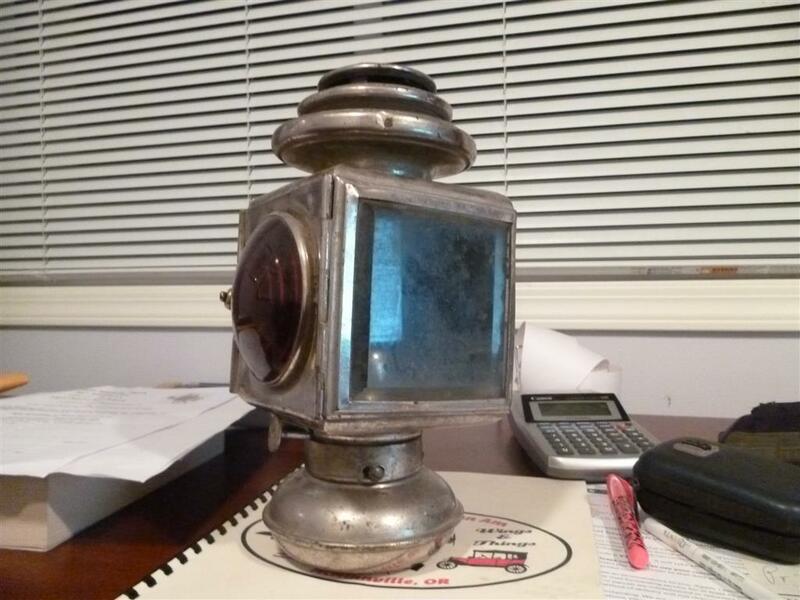 If you check out topic,More Model T treasures found in a garage,Nov. 7/14,& scroll down to Sunday Sept.28/14,6:41 PM,we posted a picture of the front of our 1909.It shows the headlights & cowl lights.I will post a better close up picture of the lights,later. 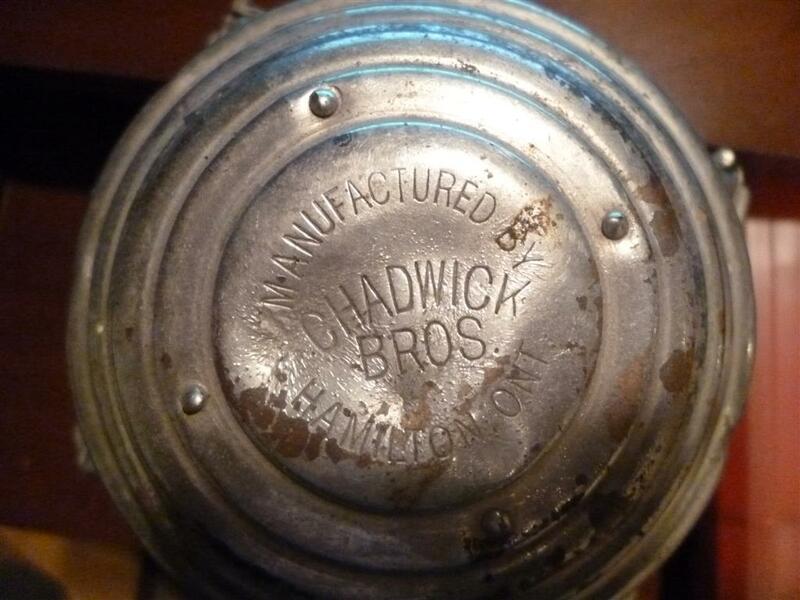 The Chadwick Bros.lights were made in Hamilton,Ontario,and used on many cars made here in Ontario. as the U.S. cars for the period. One possible lead is for someone to check the 1909ish Model T Ford at the Canadian Automotive Museum at Oshawa, Ontario Canada. That car also has some three tier chimney lamps and they may or may not be Chadwick. Note the USA provided lamps - E&J was a two tier top and the Atwood Castle 204 and Brown 60 side lamps were three tier tops � similar in style to the Chadwick. And of course there could have been variations in what each company provided. Once again, I learn something new everyday about our humble Model 'T'! My brother has a 1910 McLaughlin Buick and it has Chadwick lights. OK now we really need pictures. If you are unable to post them yourself you can send them to me roycegte at earthlink dot net and I will be happy to post them for you. I believe that our 09 has a Chadwick windshield. I will see if the pictures that I have, show enough detail to post,if not I will take some more & post them tomorrow.Chadwick also made carbide generators.I will check to see if there are any names on ours. Back in August, before we purchased the 09.My son Christopher & I visited the museum in Oshawa.I took pictures of this very original 09 Ford.Its to bad that I didn't know I should have been taking pictures of the lights etc. The tail lite I found was nickle plated at one time and has a few dents. I keep it here in the office so here's a few pictures of it. That roller in your profile looks great. Is there any chance of more photos, maybe in a separate thread? I searched the forum but couldn't find much info except a brief mention in your treasures thread. Do the right hand drive 09 Fords have a right side mounted tail light ? If so that means that they made rear lights for the right & left. I will take some pictures of the lawn roller & start a new thread.It is the only one of its make that I have ever seen. 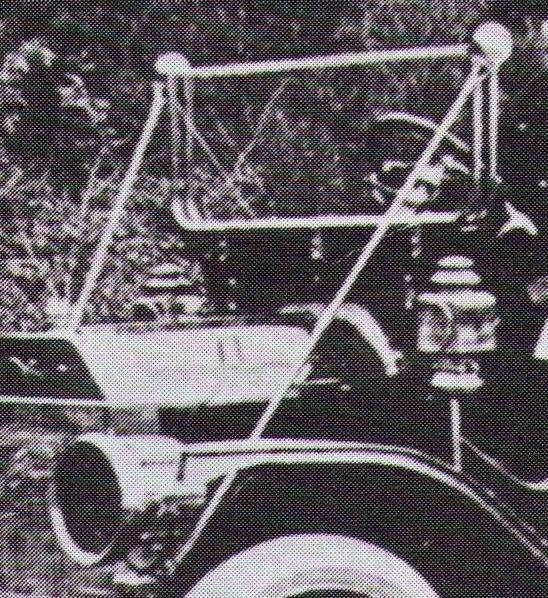 So it may have been possible that a 1909-1910 Canadian Model T Ford may have come with a mixture of Chadwick and USA windshield and/or lamps. 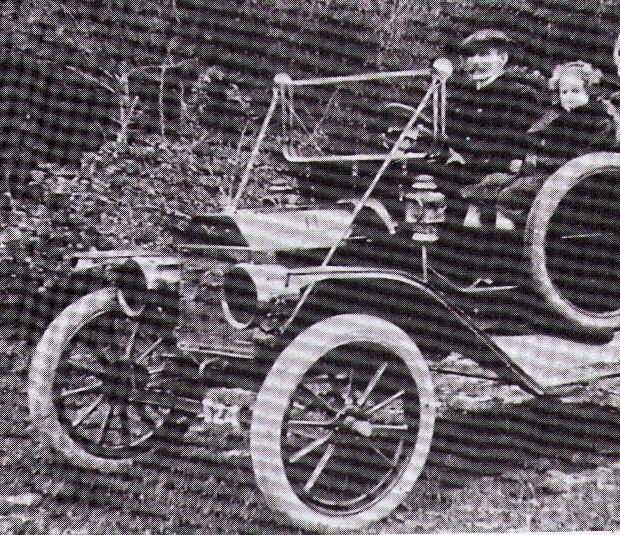 And of course the very early Model Ts in the USA were sold without windshields so one could have been purchased later. 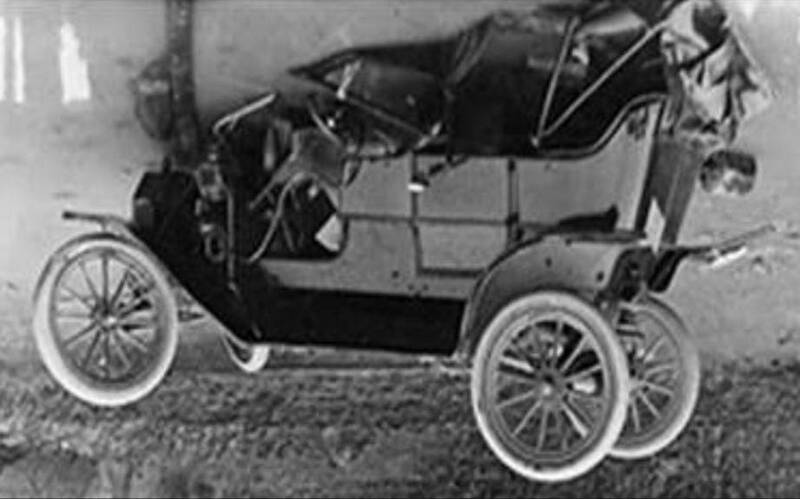 Note the windshield on the 1909ish in the Canadian Automobile Museum does not appear to be a Chadwick. This may also be an opportunity to work together to have a few Chadwick lamps reproduced? The 1929-1931 Model A Ford town cars had some unique outside review mirrors. They had new ones reproduced using an original as the sample. The oil fonts on the Chadwick lights have 2 buttons that you push in to remove the oil font.It is the same as a Solar oil font. 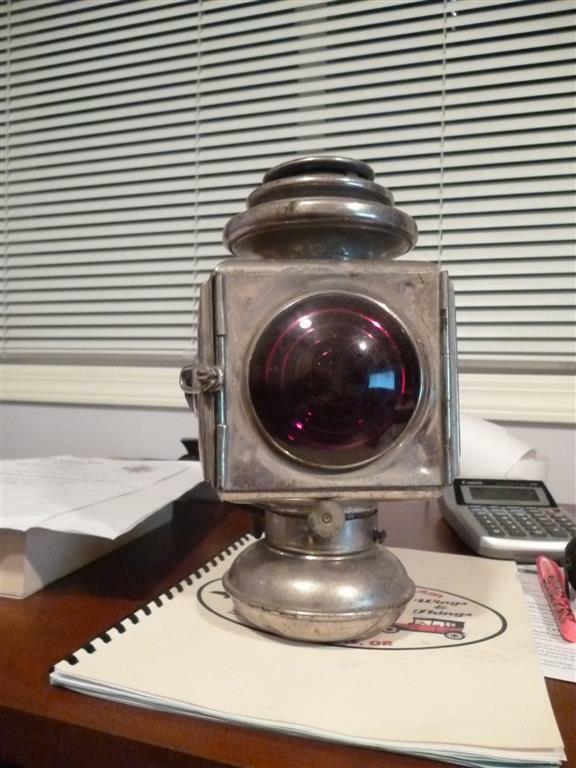 I think I have a Chadwick cowl light with the flare on the front of the light out in the garage.If it does I will post a picture of it also. This is a correction about the 2 buttons that you push in to remove the oil font.Our 09 doesn't have the buttons to remove the font.Sorry about that. Not a problem. That is one of the nice things about photos. Even if I put the wrong label on it -- folks can see what it really is. Many of us are looking forward to what else you and others discover about the Canadian Ts. You can also see what I believe are those large hinges of a Chadwick windshield on the photo above of Kin Findlay's tourabout. 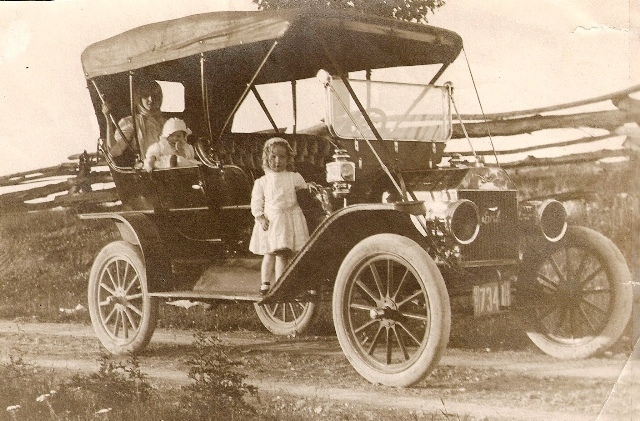 As well as the photo below from: https://www.flickr.com/photos/50312897@N02/4619778599/in/photostream/ (listed as a 1911 but I believe it is a 1909-10 Canadian touring). Note that it does NOT have the three tier Chadwick side lamps but again what appears to be the E&J side lamps or very similar looking lamps. 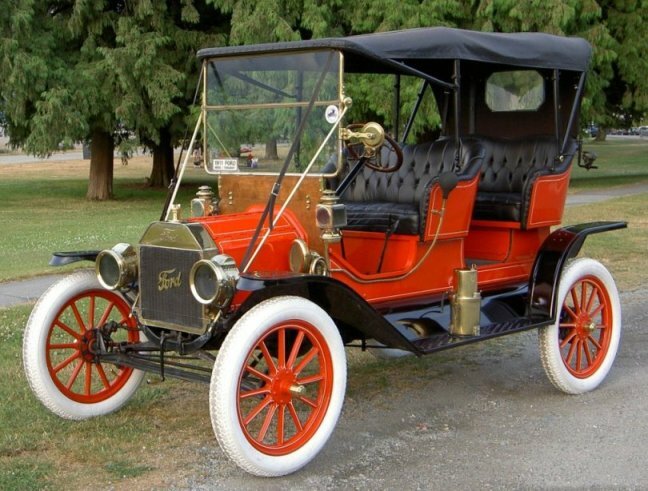 And below is another 1909-1910 Canadian touring (you can see the seam/quarter round running vertically on the rear panel and also equal size tires) as well as the tail lamp on the left side of the car. It is the one that ran off the cliff and landed upside down. I turned it so the car is right side up but in the original photo the wheels are up in the air. With this photo I cannot tell what type of windshield the car had. But we can say it had two tier lamps and NOT three tiers on the chimney. 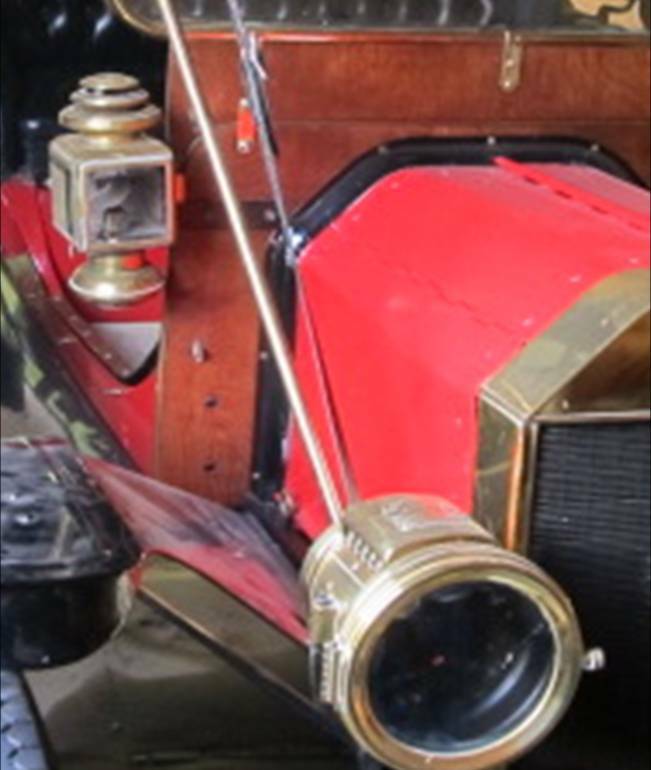 I believe both of those photos add support to the theory that some of the 1909-10 Canadian touring cars could be equipped with the Chadwick as well as other lamps. Ken Findlay's car does not have one. I don't really know if the rhd cars had the taillite on the right side instead of the left. It's hard to find rear view pictures from that era. However I have seen a lot of other brass era cars that are rhd. Most of them that I can remember have the taillite on the left side. That's where I'm putting it unless I find new info. Don is right, the tourabout doesn't have a Chadwick windshield. I'll look at it tomorrow and let you know the name. The tail light was always lit from the passenger side. The tail light mounts on the LH side for a RHD car & vice versa for a LHD car. yes, the tail lights are different and made handed. And yes, those buying lights out from the US pay to have the the lenses reversed once here to correct them for our RHD cars. For the 1913 style the tail light mounts on the RHD looking from the rear regardless of the control and the light is standardised for ease of production.